Most of the work that we do here at ActiveHistory.ca is what I have called elsewhere, passive history. Though there are a number of important exceptions (such as the History Matters lecture series, Approaching the Past, community and institutional partnerships), we generally take a ‘field of dreams approach’ to our online content. If we post it, readers will come. This has been a successful strategy. Since our beginning in April 2009, the website’s readership has continued to grow (now averaging about 15,000 unique visitors a month). Active History as an idea, however, is broader than the online forum we have created. At its core, an Active History approach to studying the past seeks to be socially transformative and publically engaging. To accomplish these goals, it is important for our work to resonate both online and in the material world (meatspace for those of you familiar with cyber-jargon). In order to be successful Active Historians, then, we need to understand how these two worlds are connected and what possibilities and pitfalls exist when we share our work in one or the other space. Digital History isn’t for everyone. In Canada, according to the 2010 Canadian Internet Use Survey, one-fifth of all households remain without access to the internet in the home. Of those households, 56% said they saw no need for it, 20% found it too costly, 15% did not have the hardware, and 12% felt they did not have the skill. More alarming, researchers at Western University suggest that in the past twelve months one-fifth of Canadians have not used the internet even once. To put this in concrete numbers: 6.8 million people in Canada do not regularly engage with online content. That’s about three times as many people that live in Atlantic Canada and nearly one million more than the total population of the Prairie provinces. If we only publish digitally, we are missing a significant portion of Canadians. Although these are the most current numbers available, they are likely already out of date. In the digital world, three years is a long time. A recent Globe and Mail report, for example, demonstrates that between March 2011 and March 2013, smartphone penetration across Canada more than doubled. If home internet use changed as well, then it is likely that more Canadians are online now than in 2010. Nonetheless, even in this more recent study, 30-35% of Canadians (10.5 million) do not own a smartphone. A significant number of Canadians remain offline. The conclusion for historians working on digital platforms: unless you’re printing it off, there remains a significant portion of the public unable to engage with your work. We know something else about this offline demographic: many of these people are poor. According to that same 2010 study, nearly fifty percent of households with incomes below $30,000/year do not have a computer in their home. Some may find this a sign of hope; another fifty percent, after all, have access to a computer. The Western University study cautions us about jubilation over these stats, however. An income-based discrepancy in internet use persists even when hardware is available. According to the study, wealthier and better-educated Canadians used the internet for more tasks than those with less money and formal learning. Inequality in wealth, therefore, has consequences for access to information. As public libraries and archives, like Library and Archives Canada (LAC), go increasingly online, there is risk of decreasing public access to these resources in meatspace. LAC’s modernization strategy serves as a good example of a one-sided approach oriented completely towards cyberspace. The policy explicitly states that today the “delivery of content has moved to a single platform, the Internet.” Data from the Canada Internet Use Survey and the Western study suggest that, though digitization is important and necessary, for some Canadians, it will make our national and local institutions less rather than more accessible. This isn’t just important in terms of access to the institutions that preserve our collective memory. It has more local consequences too. Wealth is not evenly distributed geographically. Canada is salt and peppered with rich and poor neighbourhoods and regions. In light of the Canadian Internet Use Survey data, it is logical to conclude that neighbourhoods with lower average incomes have less access to online services and content than wealthier places. Let’s take my hometown of Hamilton, Ontario as an example. I’ve nabbed two maps off the internet from an important study conducted by the Hamilton Spectator. The first map depicts per family median income. Notice how wealth is distributed. 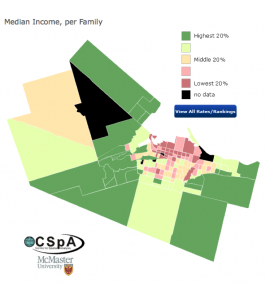 The richest families live on the outskirts of the city, while the poor live in the downtown and industrial core (near Hamilton’s heavily industrialized harbour). Now look at the second map. 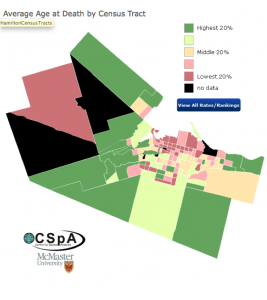 This map depicts the average age of death of city residents. Immediately you can see that income and health outcomes are co-related (an important conclusion of the study). What is not as apparent, however, is what this actually means. In real world numbers, the difference between the dark green and dark pink areas on this map is twenty years. If you live on the West Mountain, you can expect to live until you are 86.3, while if you live in the city’s North end, you’ll likely just make retirement, living until you are 65.5. These numbers are shocking. If we place them alongside average life expectancy by nation around the globe, we can see their magnitude. West Mountain residents will likely live longer than most of the global population (only Monaco has a higher average life expectancy); while North-enders share the same life expectancy as the Burmese and fall into the bottom quarter of the global population. Seventy-five percent of the global population will likely live longer than someone living in this part of the city! History matters here. The circumstances that created this situation are historically constructed. In their article, “Blighted areas and obnoxious industries: Constructing Environmental Inequality on an Industrial Waterfront, Hamilton, Ontario, 1890-1960,” (which is unfortunately behind a paywall) Ken Cruikshank and Nancy Bouchier chronicle the environmental history of many of the neighbourhoods coloured pink on these maps. The stories they record about community cohesion and environmental change help us understand the social, environmental and health challenges that people in this part of the city faced (and continue to face). First, although digital tools have made it much easier for historians to share our work, they are not a panacea solution. If we believe that our research matters for all people (regardless of income and ability) and can positively shape pubic policy, then we need to ensure that our research is accessible both in cyberspace and meatspace. Ronald Rudin‘s multimedia projects serve as a good example of a type of Active History that integrates digital and material forms of dissemination. Rudin, a historian at Concordia University, has turned his research into books, films and websites, increasing the opportunity for diverse forms of public engagement. Second, as libraries and archives take their material online (a positive move), they need to look more deeply at how users interact with online tools. Policy-makers need to be especially vigilant about geographies – like Hamilton’s North end – where it is likely their users cannot get online. Nuanced policy-making that inter-weaves online and material resources will enhance public access to information and, hopefully, encourage informed public decision-making. Similarly, the internet is often seen as an ideal tool to connect Canadians living outside urban centres. Policy-makers, however, need to confront the reality that people living in rural Canada use the internet less often than urban Canadians. The Western study cited earlier suggests that people living in urban areas are 54% more likely to use the internet than their rural counterparts. This too is partially related to income. According to the Federation of Canadian Municipalities, rural Canadians make about $10,000 less and “are more likely to be in poor socio-economic conditions, to have low educational attainment, to exhibit less healthy behaviours and to have high overall mortality rates than urban residents.” Over emphasizing digital history risks exacerbating these trends. Historians and policy-makers should spend time considering how to engage with this population. By way of conclusion, I want to be clear about my motivation in writing this post. I have not written this essay as a luddite yearning for a less-digital golden age. Rather, working with ActiveHistory.ca primarily on a digital platform, I offer this reflection as a reminder about the importance of engaging the public in meatspace. Digital tools have made real and positive changes to how historians practice and communicate our ideas, but the material world still matters. As online services and digital history grows in prominence, Active Historians need to critically reflect on their audience and understand who isn’t able to come into contact with our research and ideas. We also need to push back against projects that over-emphasize the potential of online dissemination. Instead we should emphasize ways in which the digital and material worlds can interact, reinforcing and enhancing the public’s access to information and analysis about the past. Thomas Peace is a SSHRC postdoctoral Fellow in the Native American Studies Program at Dartmouth College. This ideas underpinning this essay were originally delivered during a round-table on “Reaching the Public through the Web: The Practice of Digital Active History” at the annual meeting of the National Council on Public History in April. Great post, Tom! This is an excellent reminder that being an active historian involves more than just open, online engagement. We should remember that there are numerous active historians throughout Canada who share their research and ideas at public lectures, museums, and libraries. Those of us who strive to make online contributions should also try to get out into our communities. The History Matters series, as you mentioned, is a great example. I really liked this. (Those who know me, as a defender of real-world interaction, will not be the least surprised.) I’d add that the benefits of ‘material/meat’ exchange are not just about equity but are often pedagogical – sometimes people just learn better from people. (It’s not simply generational.) Blogs, online archives, podcasts, and the like are great; so too are discussions, lectures, books, sites, and warm-blooded interaction. Excellent post with some very important observations. It makes very clear that democratisation of historical knowledge cannot only be achieved by the use of the Web. It needs to be a mix of online and off-line activities and publications. Tablets and e-readers next to paper based sources; online audio and video next to public lectures. And as Claire pointed out there are also sound pedagogical reasons for this. Perhaps there is also space for turning blog posts or other online content into books. Publishers will be interested if content online will supplement print material and the other way round. Indeed, digital is great but we must not neglect the “old” media to reach parts of the off-line population. Excellent observation – real communication cannot happen online anyway – only information sharing is possible form behind a screen. Active history is about so much more than written dialogue in any form and the more historians we have who understand that their research is only as valuable as their ability to share, and engage with, their findings in many settings work toward real change and difference! Thanks Thomas! Good stuff, Tom. I have a feeling this is going to help bring an added dimension of discussion to public history programs in Canada with substantial digital components. Of course, we should try to do both (and different people have different skillsets which might lead them in one direction or another). I’m not sure if I buy that “real communication cannot happen online anyway,” Matt, which is sort of a slap in the face to the thousands of real online communities which both currently exist and have historically existed for the last thirty years. Yes, there’s a good literature on the question of online community (which I’m currently engaging with in one of my own projects), but this sort of sweeping dismissal strikes me as unhelpful and ahistorical. That’s not to say that digital utopianism doesn’t get carried away sometimes, don’t get me wrong, but your sentiment swings a bit too far in the other direction. Just my two cents anyways. Thanks Tom for this important post and to everyone else for great comments. A few years ago I helped organize and present at a poorly attended public history event at the Hamilton Public Library. I expect a lot of the same social and economic divisions that prevent our website content from reaching industrial and working-class neighbourhoods in Hamilton remain true when trying to bring history to “meetspace”. I’ve also co-lead a very successful walking tour down the Lower Lea Valley in East London. I did not get a chance to speak with all of the participants, but I’d guess the majority of them were educated middle class people with an interest in urban affairs and history, access to the internet site that promoted the walk, and that most of them traveled in from other parts of the city. All of this is to say that a passive “field of dreams” approach, on or off the web, will often lead to similar results in terms of audience. There are, however, some really impressive examples of historians, Tom included, being more proactive and building networks between academic history and diverse communities. We’re hoping to feature a few blog posts from the S.P.A.C.E. (Spotlighting and Promoting African Canadian Experiences) initiative, based out of the Tubman Centre at York University, in the weeks and months ahead that will hopefully inspire more great project in the future. In the spirit of what Tom says in his excellent piece, I often ask: if it doesn’t matter in “meatspace”, then does it matter at all? Or perhaps, the question is: how does this (the think I am working on or the work I am reading) matter in meatspace? Knowledge, assumptions, arguments and attitudes translate into something in the material world, but into what exactly?, and how does that translation happen? Grateful for an accessible, evidence-based piece about this issue!